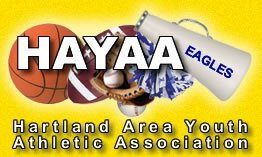 The Hartland Area Youth Athletic Association (HAYAA) is an all-volunteer organization that provides recreational programs for children (5-16) in the Hartland Consolidated Schools District. *Please note: Hartland Community Education and HAYAA are two separate organizations. For questions about HAYAA programs, contact hayaasports@yahoo.com or visit their website, www.hayaasports.com, for all of the current seasonal sports information, registration dates, fees and contact phone numbers for the various Commissioners in charge of the many athletic events offered through this volunteer organization. Every effort is made to give timely information through articles in the Community Life newspaper each month. Participants are able to register online for HAYAA programs using a credit card or PayPal account. Other information provided on the HAYAA website includes: game schedules, calendars and maps to fields or facilities.